You know what's made this winter different than all other winters? This winter is different -- and indeed, glorious -- because Connor and Natalie can both get dressed in their snow gear BY THEMSELVES and go outside to play. Up to this point, they've lacked the coordination and the enthusiasm necessary for such an involved endeavor -- which meant we were almost LITERALLY indoors from late November until mid April. The Twin Cities offers many amazing indoor escapes for families, like the Children's Museum and countless indoor playgrounds and water parks and the Mall of America. But still. That's a long time to be inside. It's the very definition of cabin fever. But this year, something clicked. 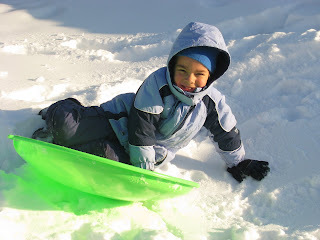 Now, when the doorbell rings each afternoon around 4:00, signaling that the neighborhood kids have also arrived home from school, my kids jump from their Legos or their book reading and practically sprint for the mudroom, where they don snow pants and coats and boots and gloves and hats. 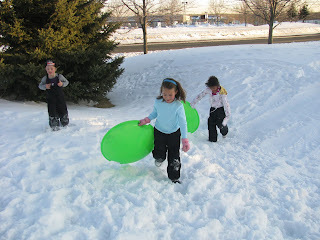 Then they grab their sleds, run outside and play until the sun sets (or the cold forces them in, which happened more frequently during sub-zero January days). Like much of the U.S., the Upper Midwest has enjoyed a bit of a warm streak this week. Our days are bright with sunshine and the melody of melting snow. Our afternoon highs have been above freezing for the past three or four days. 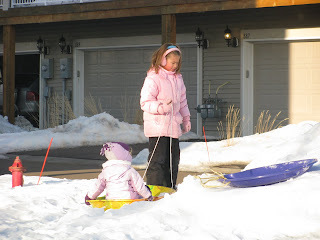 So yesterday, when the kids were getting bundled to play outside, and their sweet little sister asked to "go too?" and I heard Natalie say, "Mom! Is it OK if we take Teyla outside with us for a while?" I decided to join the fun. Warm weather aside, the snow is still knee-deep -- and that's for an adult. 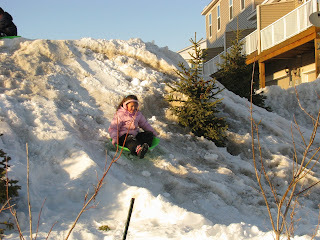 The kids were super excited to take Teyla to the big sledding hill on the other side of our development. 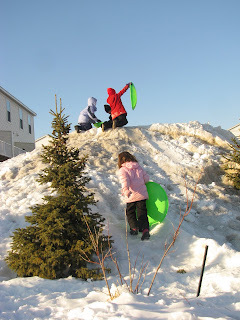 The peak is a huge mountain of leftover snow scraped from nearby streets and driveways. 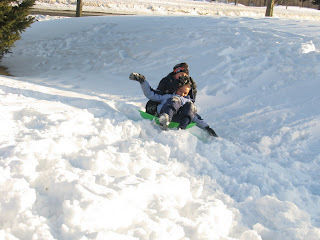 But it continues down a real-life hill that ends in a small ditch, and since one of the neighborhood dads has helped the kids make a solid path for sledding -- complete with walls, like a mini-luge -- it has wicked speed and lots of twists and turns. Sometimes, they even lost the sled. Amid the whoops and screams and tumbles, the kids got "so hot!" that jackets were shed and cheeks nearly split from laughter. "What?!? We're really hot! I mean, it's like 37 degrees!" 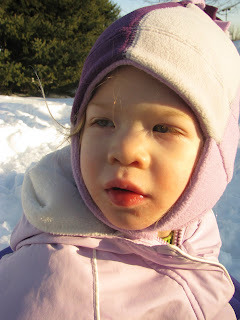 Teyla, meanwhile, contented herself with sitting by my side and watching the sled-a-palooza. Oh. And eating snow. Forget sledding. 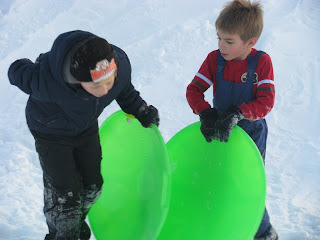 That's the true winter Olympic sport for the three-and-under set. Days like this, I love Minnesota. What fun! And thank you for the reassurance that it's not just me being lazy or a bad mother because my two little ones (both under the age of three) rarely see the outdoors from the end of autumn to the beginning of spring. It's normal! I'm a normal mother! Hallelujah! 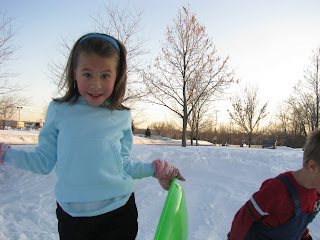 Wow that was so cool of that Dad to make them such a great sledding track! I'll pass that along to Al so he can be the cool Dad around here next year! They look so rosy cheeked and happy and healthy and robust. Sunshine is such a balm, isn't it? Glad you got out, too. That can do a Mama good, for sure. I totally hear ya on the snow gear thing!! Especially when they come back inside withing 15 minutes because they are too cold!! Your kids are simply adorable. LOVE! The boysies around here are still much too little to get their gear on by themselves, but I think the novelty of the whole thing will be enough motivation for me to don the whole schebang most days! 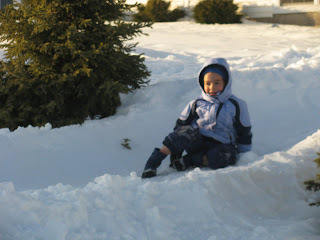 I think partly snowsuits for the younger ones have a higher fluff to body ratio. They are so hard to move in that many kids can't until they grow up a bit and they look a bit less like marshmallows in their winter clothing. That's my theory anyway. 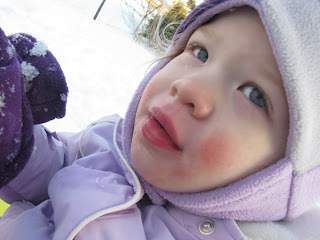 I've been dragging Elizabeth outdoors anyway but she's not exactly frolicking in the snow on her own. I can't wait until she is though! Mocha with Linda - You just get used to the cold. I heard your blood gets thicker in the winter. Must be true - you feel colder in the fall than in the spring at the same temperatures! So fun! 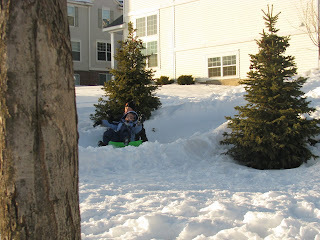 It's so encouraging to hear that your kids have become snow-lovers. Tate hates hat, mittens and boots...thus he also hates being in the snow longer than 4 minutes because of course he gets cold. :( There's hope, there's hope!